What we know is that smell is the oldest sense, having its origins in the rudimentary senses for chemicals in air and water – senses that even bacteria have. Before sight or hearing, before even touch, creatures evolved to respond to chemicals around them. Sight relies on four kinds of light sensors in the human eye, cells known as receptors, which convert light into the electrochemical language of our brain, and touch relies on different receptor types for pressure (at least four of these), for heat, for cold and for pain, but this pales into comparison for what is required for detecting smell. There are at least 1,000 different smell receptor types, which regenerate throughout your lifetime, and change according to what you are used to smelling. The result of this complexity is that we are able discriminate many, many different kinds of smells. We do not, however, have names for all the smells we can differentiate. Smell is perhaps the sense we are least used to talking about. We are good at describing how things look, or telling how things sounded, but with smells we are reduced to labelling them according to things they are associated with (“smells like summer meadows” or “smells like wet dog”, for instance). An example of this “hard-to-talk-about-ness” is that while we have names for colours which mean nothing but the colour, such as “red”, we generally only have names for smells which mean the thing that produces that smell, such as “cedar”, “coconut” or “fresh bread”. The part of the brain that is responsible for processing smells – the “olfactory bulb” – is next to a part of the brain called the hippocampus. This name means “seahorse”, and the hippocampus is so-called because it is curled up like a seahorse, nested deep within the brain, a convergence point for information arriving from all over the rest of the cortex. Neuroscientists have identified the hippocampus as crucial for creating new memories for events. People with damage to the hippocampus have trouble remembering what has happened to them. Smell is unique among the senses in that it enters directly deep into the brain. If we look at the major pathways traveled by the other senses, such as hearing and vision, they start at the sense organs – that is, the eyes or the ears – and move to a relay station called the thalamus, before passing on to the rest of the brain. With smell the situation is different. 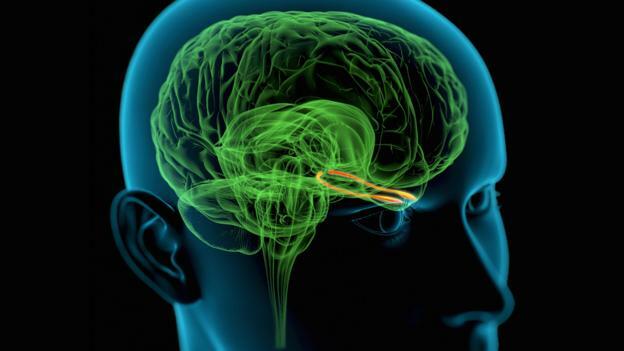 Rather than visiting the thalamic relay station on its journey into the brain, smell information travels directly to the major site of processing – the olfactory bulb – with nothing in between. We do not know what stopping off at the thalamus does for the other senses, but it certainly means that signals generated in the other senses are somehow “further away” from the nexus of processing done in the brain. Could this be part of the reason why smells are both hard to put into words, but also able to trigger deeply hidden memories? Memory research has shown that describing things in words can aid memory, but it also reduces the emotion we feel about the subject. When we come up with a story about our memories, we start remembering the story as much as the raw experience.